This is a large, single draw Dollond telescope. Overall length with sunshade extended is 39.75”. It looks perfect, but the eyepiece sliding lens protector is missing. The eyepiece itself is painted black on the end. 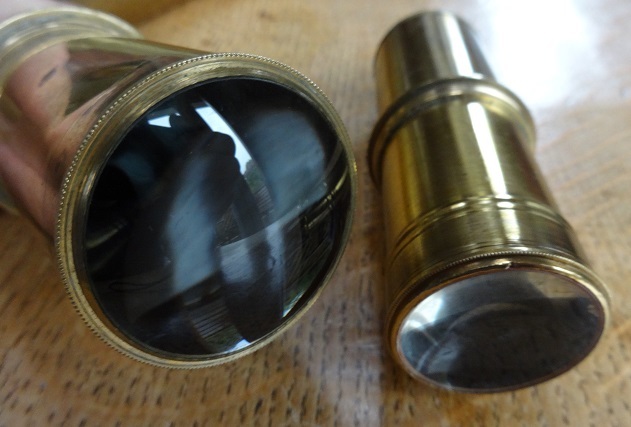 The eyepiece brass shape is tapered, perhaps more like a church-bell shape than what I know as the Victorian “bell-end” eyepiece, which tends to be more of a bulbous shape. 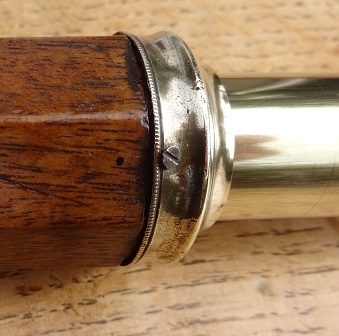 The first and only draw has a screwed joint half way along, which is where the second eyepiece lens pair is located. 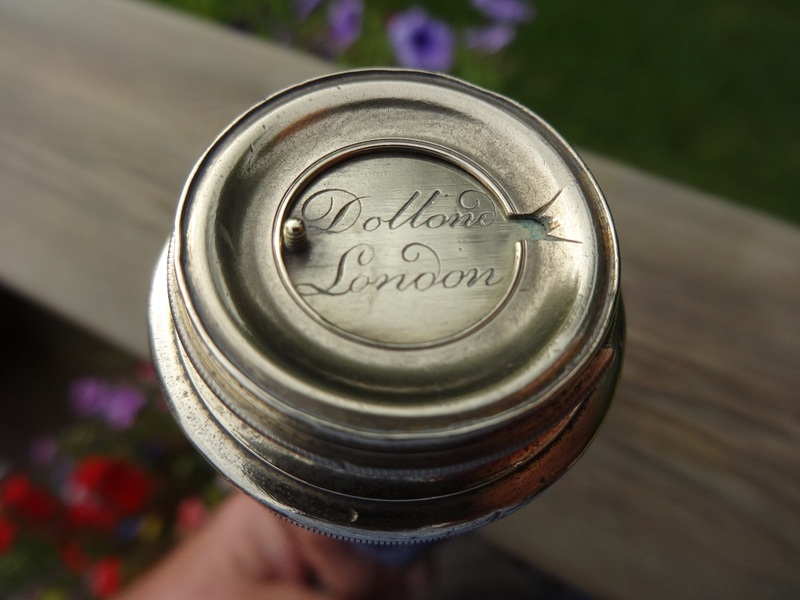 The engraving on the left of the first draw is shallow, but it is “Dollond London”; “Day or Night”; “5009”. This is all in a Gothic like script. Possibly the 5009 (construction number?) might give a date, but I have no information on that. 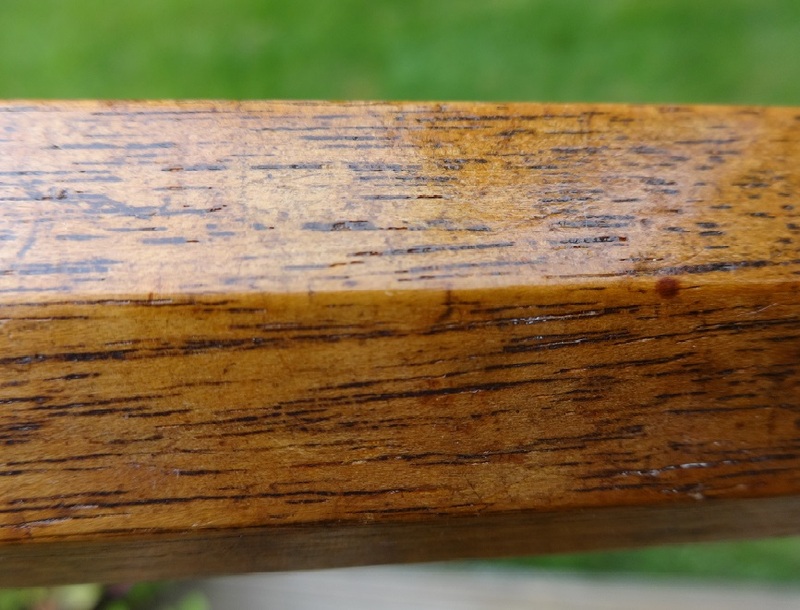 There is evidence of soldering to the draw around where the mid-joint is located. 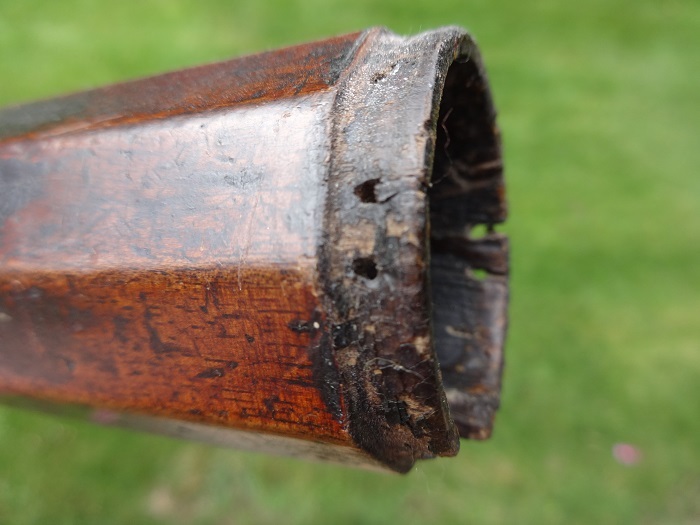 The main barrel is covered in good quality soft leather, or maybe some other animal skin, light brown and dappled: this will later be shown to be a replacement in around 1930. 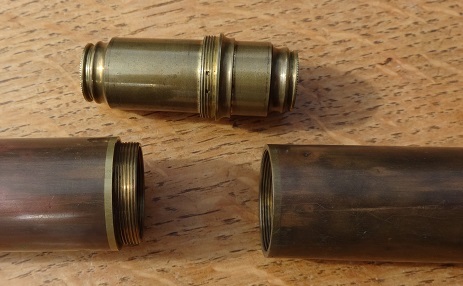 The sunshade is again brass, and this has a push on brass end cover/end-cap. 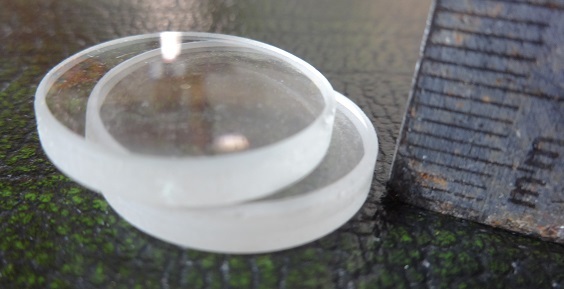 The lenses are all in excellent condition, but the objective lens pair was retained in place with a sort of brass peened rim, which during its 1930s cleaning was pulled back to allow the lenses to be released. Perhaps needless to say the telescope works really well. The bits that came with this telescope accelerate it into being one of the most interesting items I have ever seen. I bought it on Ebay in 2011, and decided to collect it in person because of all the extras: luckily it was in Bournemouth relatively close to home. 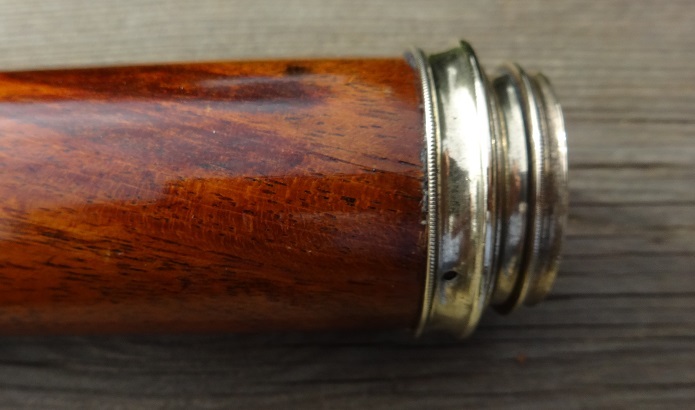 The seller said it had been found in a house clearance in Swansea. He also said he had never had anyone pay him more than the winning bid price on Ebay before – needed because I felt it was worth more. Inside there are several pictures (modern, colour pictures) of sailing ships taken from, for example, the paintings by J.Spurling of the 1866 tea clipper races, specifically of the ships Ariel, and Taeping. 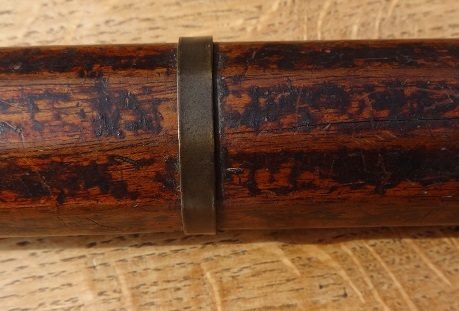 The box itself is fitted with cut-outs to hold the telescope, and also contained a mounting bracket, which could possibly be fixed to a hand-rail or ship’s structure, which then had a pair of leather straps to hold the telescope in place in a cradle, at its balance point. Whether I would trust that on a ship at sea I doubt, but it might work on an Irrawaddy paddle steamer. It is now in use on our decking in the back garden. The documentation that came with the telescope is fantastic. For this we owe a debt of gratitude to the guy who recorded and recounted his relationship with this instrument, over 40 years. He was Frank Musgrave, the retiring Commodore of the Irrawaddy Flotilla Company (IFC) in around 1932. 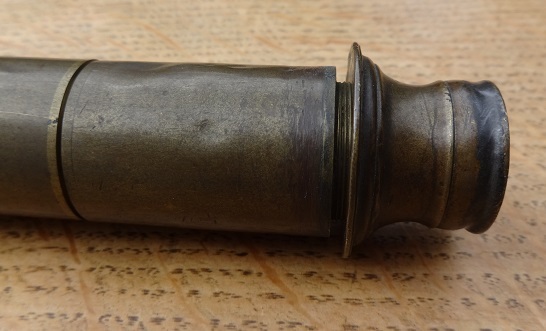 He had owned and used the telescope since 1891, and he had it cleaned and re-covered (in Burma) to present it to his successor in Rangoon in 1932. His letter to James Bichard, enclosing the telescope pedigree, is a beautiful document, in black ink on IFC official paper: but, for Google, I will type it here, as a chronology, and show just a little in a scan. 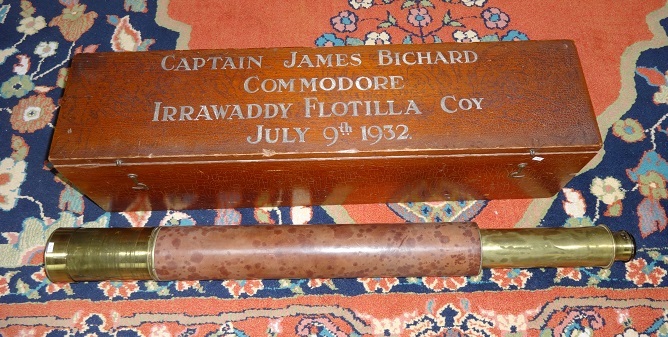 He gave the telescope with its pedigree to James Bichard, when he took over the role of Commodore of the IFC in the Summer of 1932. 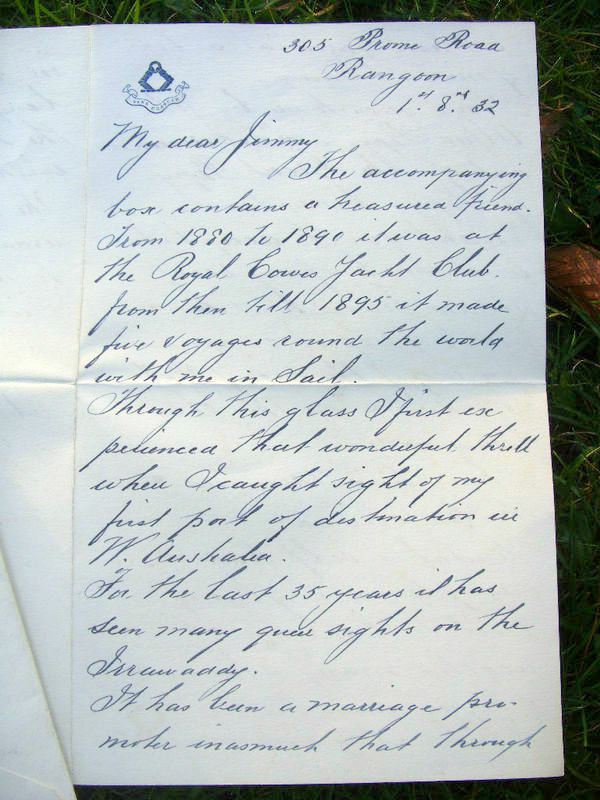 1880-1889: The telescope was in the Royal Cowes Yacht Club. 1889-1891: In the Royal Victoria Yacht Club at Ryde (which was established as different to the above in that it allowed ladies to enter the premises). Obviously Queen Victoria would not have been amused at the restrictions imposed by the Cowes Yacht Club. 1891: Sailed with Bichard, who was quoted as a “Mate” on the Barque “Helena Mena” of the Elder Line from London to Freemantle, carrying emigrants out, and coming home – with wool fleeces – via the Cape of Good Hope. 1892: London to Freemantle and back, as above. 1893: On the “Oriana”, described as an F.R. ship, from London to South Shields, presumably to pick up a cargo of steel, or machinery, or similar: then to Port Pirie, Adelaide, and Port Augusta, South Australia, and home via Cape Horn. 1894: A repeat, London to South Shields to Port Pirie, and Port Germain this time, then Port Augusta and home via Cape Horn. 1895-96: On the F.R. ship “East Croft” from London to Newport, Monmouthshire, thence to Maryport in Cumbria. Presumably the cargo was picked up at these two places: maybe coal in Newport(?) and chemicals in Maryport(?). Thence to Acajulta in San Salvador (on the Pacific Coast). East Croft spent 6 months transporting cargo, maybe coffee or minerals, between Acajulta and San Fransisco. Then returned from San Fransisco to London, a journey that took them 186 days (round the Horn), of which the last 42 days were spent with limited food-stock, so they were eating only dry biscuit and tea “sans sugar, sans milk”. 1897-1932: After this obviously Bichard had a career rethink, and moved in June 1897 to work for the Irrawaddy Flotilla Company in Rangoon, Burma (now Myanmar). Starting as a 2nd Officer he progressed up the ranks to become Commodore. Bichard was a colleague of Musgrave’s in the IFC, and the letter was addressed to him on board the SS “Ceylon” in Rangoon. The Royal Victoria Yacht Club at Fishbourne, Ryde (R.V.Y.C.) was founded on 24 May 1845 by Prince Albert to give Queen Victoria a Yacht Club which she was entitled to enter as a mere female. The original club location was at Ryde and was one of premier racing clubs in the land, and indeed the world. Members owned some of the finest and most competitive vessels of the time. The Helena Mena, Oriana and East Croft appear similar. They are sailing ships built with a ‘composite’ construction, ie with a wrought iron framework and hardwood planks bolted on as cladding on the ship sides, as was the fashion with tea clippers in the late 1800s. This gave a much larger cargo hold capacity, without any large wooden cross beams. Many of these were then clad with thin sheets of copper, to stop marine growth on the outside of the hull. One of the few ships of this style that still exists is the tea clipper the Cutty Sark, now moored in Greenwich, which was built in 1869. Visitors to the Cutty Sark can see some of the telescopes suggested as used on board that ship. In 2012 there were two other similar composite ships known, the passenger clipper City of Adelaide, and the sloop HMS Gannet. The Helena Mena was a bark of 673 tons, 165 feet long, built in Sunderland for J.Wilson in 1876, with the Captain quoted as O.Wadstrom. 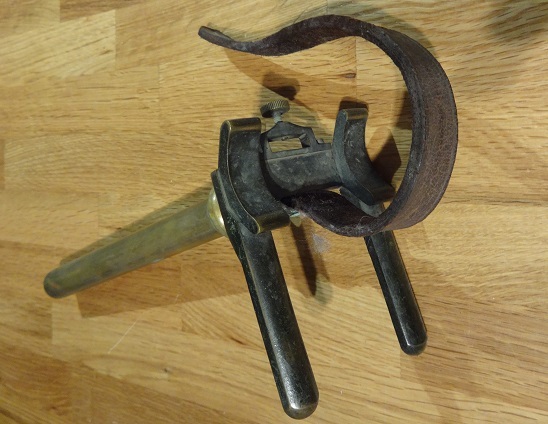 The picture found shows it with three masts, metal (copper?) clad, no deck structures. The Maritime Heritage Association of Australia in 1991 advised that Helena Mena’s hull was painted black with a yellow-gold sheer line. The raised poop was white, the deck house white and wood and the mouldings gilded. Her buxom figurehead was referred to as “the blue lady”, and the crew sang a sea shanty about her. She wore a white, high neck blouse with long puffed sleeves beneath a blue, apron style dress, and black shoes. 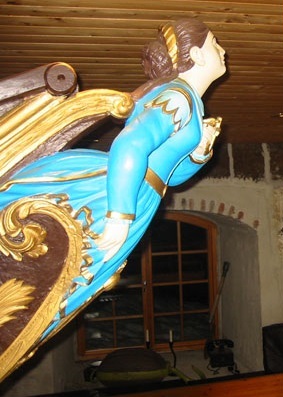 A picture of the figurehead from a similar freight ship of the late 1800s, also called the Oriana, can be found on the website of the Oriana Kro inn in Northern Norway, at Nusfjord, on the Lofloten Islands, www.nusfjord.no. The owner at that time acquired the Oriana as a cargo vessel. The story from the Oriana Kro Inn at Nusfjord is from the same era, the Oriana was quoted as a three masted sailing ship from England. The vessel was named after the owner’s daughter, and on board as one of the crew there was a young lad from Bodø in Norway. The two of them fell in love, but the ship owner did not like this, so offered to give the boy the ship, if he would sail away and never see his daughter again. This was no movie, so the boy took the ship option, sailed it to Norway, and sold it to the land owner at Nusfjord! Later, the ship was wrecked in a storm near Brønnøysund: sport divers recovered the figurehead and the ship’s bell much later, and both are now on display in the Oriana Kro tavern. 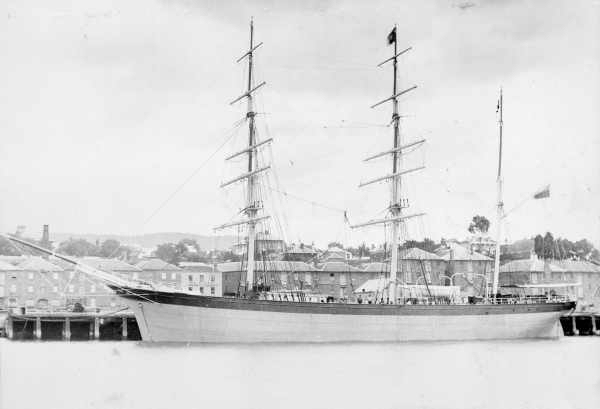 The Oriana that went to Australia with emigrants in around 1894/5 with Frank Musgrave was built in Greenock by Scott & Co in 1864, was an iron barque with two decks, 1050 tons, 202 feet long and 33 foot beam. Her Captain was R.Mosey from 1887, and D.Davies from 1896. 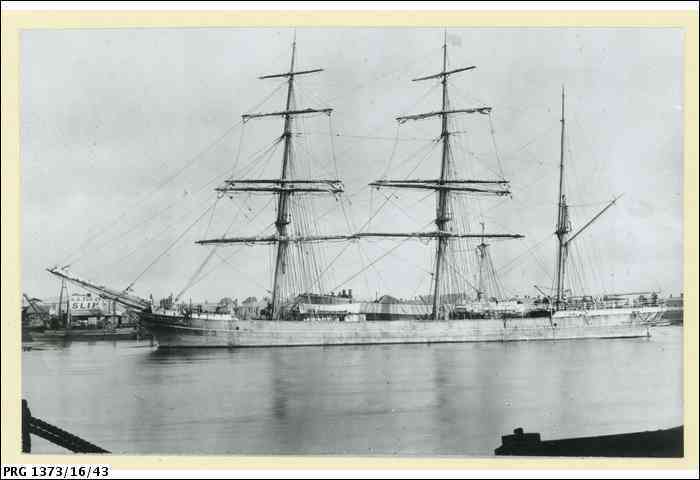 Trinder, Anderson & Co sold her in 1897 to S.Razeto in Italy, and she was re-registered in Genoa under the same name. The ship was then sold to Argentinian owners, and later was dismasted at Corrientes, Argentina. Pablo P. Pesce, an Argentinian shipowner bought the hulk and had her re-rigged again at Astilleros de Badaracco en la Boca. On June 6th, 1917, Oriana was on a voyage from Santa Fé to Genoa with 801 tons of iron, when she was captured and scuttled by the German submarine U-64 (Robert Moraht), 2 miles southeast of Cap Camarat, near Toulon, France, in the Mediterranean. The pictures of Oriana found show her in dock at Port Adelaide, about to load sheep fleeces for the 6 month voyage back to the UK. The East Croft was also an iron framed, wooden clad ship, around 1367grt, built in 1875 by Harland & Wolff at Belfast, for John Gambles, of Workington. She was commanded first by Capt John Tayler Rimmer, until his retirement in 1895. It was then believed to have sailed under the British flag until 1897, with D. Connack as Master and Trinder, Anderson & Co as the owners: these must have been Musgrave’s bosses. Lloyd’s suggests the owners from 1899-1900 were Trinder, Anderson & Co, with a Capt W Hamond. 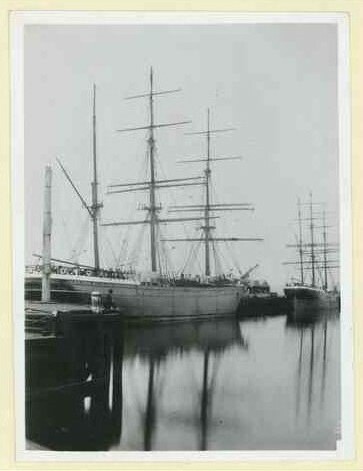 She was then reported as bought by Norwegian owners at some time later, retained her name, but was quoted as being “reduced from ship to barque rig”. Later, in WW2 (1939-45), the IFC manager in Rangoon was called John Morton: it is not known whether James Bichard was still there. When it became obvious that the Japanese were going to overwhelm their defences and occupy the whole country, in 1942, it is said that James Morton took the independent (of his bosses in Scotland) decision to scuttle all 600 of the IFC paddle steamers and ships on the Irrawaddy, in the rivers, preventing them being used by the Japanese and blocking the landing stages. This effectively set back the Japanese advance through Burma, as other road transport communications were very limited,and the alternative was to treck through the jungle. Up at the top of the river, across from Mandalay towards Imphal, became the main battle zone between the British and Indian armies and the Japanese troops: where both sides were hampered by extended jungle supply routes which used horse and mule trains. This was where my Dad was fighting. 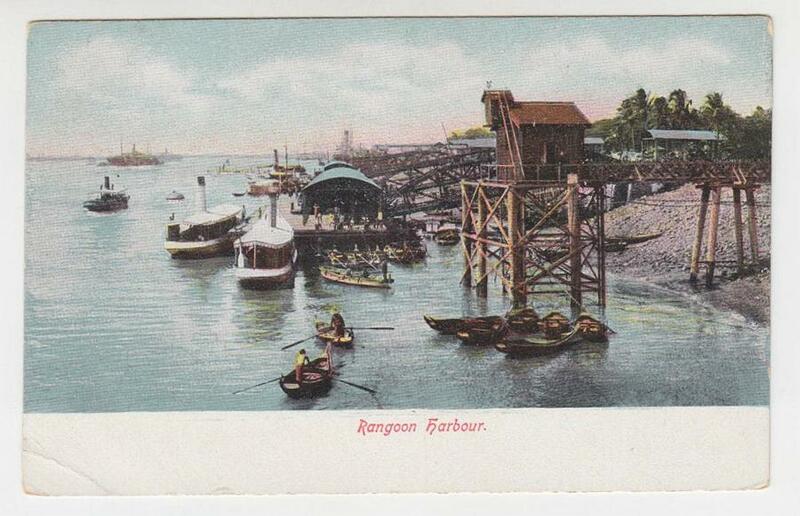 I would guess that James Bichard was not in Rangoon in 1939: if he had been there, the telescope would not have eventually returned to the UK, and would have lost its associated documentation. So Bichard himself must have retired – maybe to somewhere near Swansea – and brought the telescope back with him. What was the telescope doing before 1880? 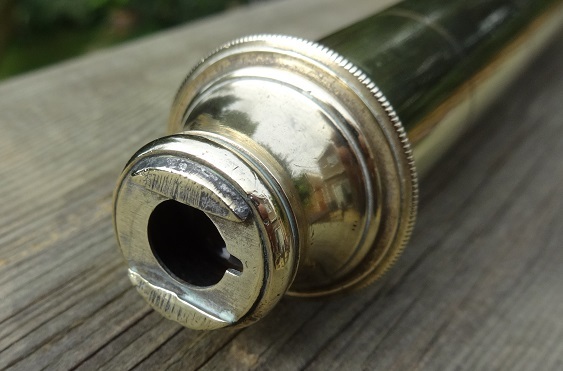 Obviously someone presented the telescope to the Cowes Yacht Club, but it was not engraved for them, so it was obviously a used telescope at that time. Presumably they set no great store by it, so it was left in its box, unused maybe: and it was therefore deemed suitable as an item to be presented to the break-away Royal Victoria Yacht Club at Ryde. 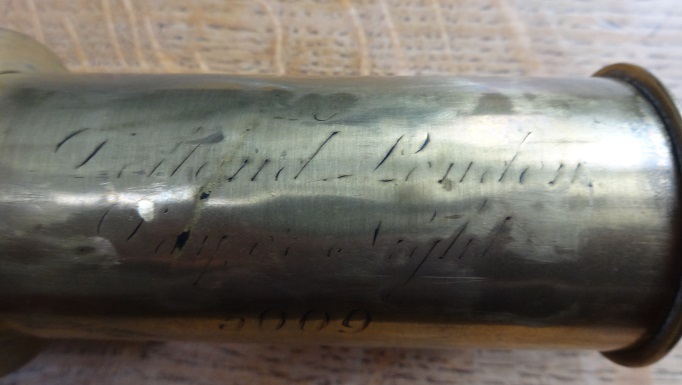 It does appear that the telescope was probably manufactured between 1830 and say 1860, to take account of the old scrolling Gothic script in the engraving, but not earlier than that because of the large bore brass tubes used. Lovely telescope, but very heavy! Not easy to use to lift up and follow aeroplanes. It would find best use overlooking a shipping channel, screwed to a balcony rail. What is fantastic is the documentation, and the associated history, linking the emigrants to Australia in the late 1800s to the trade in fleeces, providing a link to the Irrawaddy paddle steamers in Burma up to WW2. 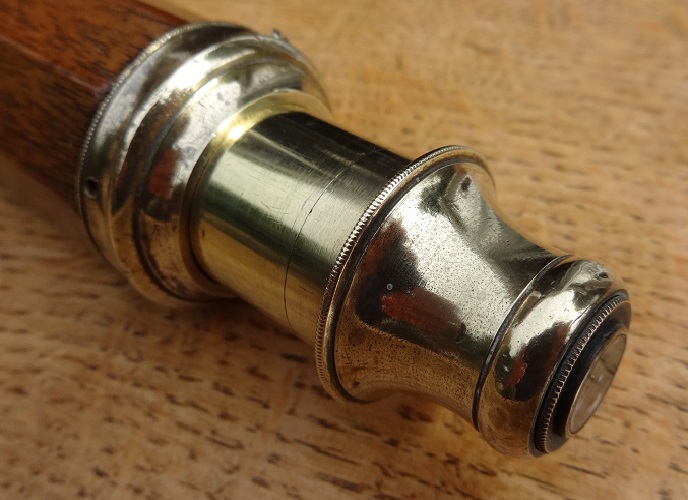 It would be even better to link the telescope to the Pepys family: Samuel was Chief Secretary to the Admiralty under both King Charles II and subsequently King James II, and so effectively in charge of the Navy. He died in 1703, maybe only 40 years after Newton discovered how to make a telescope. 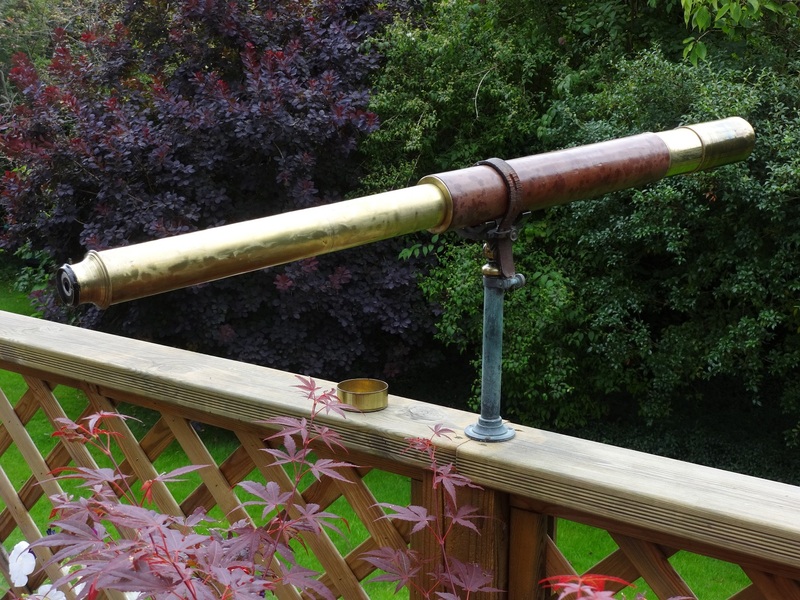 Maybe the first naval telescopes dated from 1760. 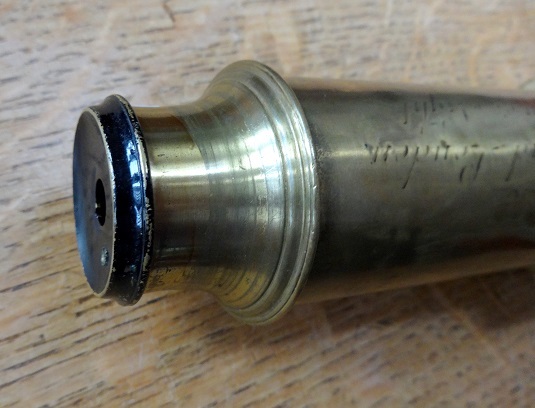 The John Alfred Pepys that probably presented Musgrave with the telescope, born 1832, is recorded as living on the Isle of Wight at around the 1890s, and no naval links have been found. 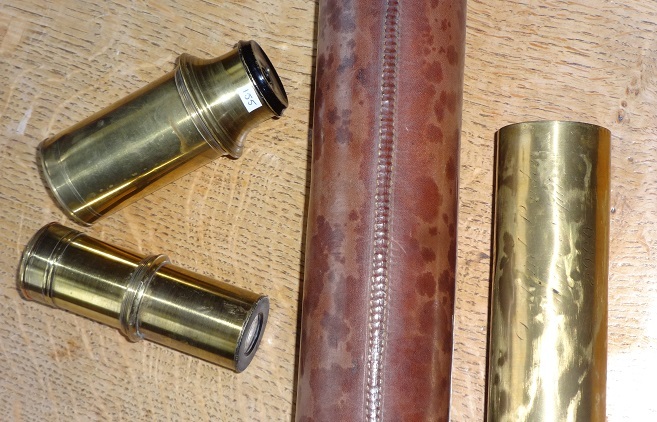 The problem is that there is no other telescope with such a well documented history to compare it with, plus it is in excellent undamaged condition. I have enjoyed researching and using it. Maybe there is another place it would be more appreciated. Offers over GBP £7000 will be considered!